What is the best location to put the device? The Bug eater works by line-of-sight, so if the bugs can see it, they will be attracted to it. Put it where it gives maximum exposure to the area you want to clear. The more mozzies that can see it, the better the kill. Don't make them work too hard to get to it. Waist height is ideal. If you can, point it at the likely breeding source. Try to locate it where it will not be in competition with other light sources. It will work best where it is the only light the bugs can see. You don't necessarily put it in the area you are trying to protect, eg your outdoor patio. If sheds or trees, shade parts of your yard, then move the bugeater around so that it shines into those areas too. Can it be put outside in the weather? Yes. The bugeater is designed to be put outdoors. Make sure it can't be knocked over by pets, animals or kids, by using the mounting bracket that comes with it. Make sure the join in any power lead you use is protected against getting wet. The Bugeater comes complete, ready to use, including the bracket, - all you need to do is add the water and detergent. Which is the best light tube to use, black or white? They are both UV "black" lights. The black one is the standard one that comes with your bugeater, it gives off less human-visible light. The white one is useful as a night security light. It doesn't really make that much difference. Some studies suggest that the UV black-blue light works better for sandflies. Both lights are visible to the human eye, so if you can't see it when the bugeater is on, the globe is not working! The globe may have come loose. Turn it off and rotate the globe to make sure its making firm contact. Usually every morning, but if it fills up quicker, or slower, let that be your guide. If there are too many moths floating on the surface, it will stop the other bugs drowning- the mozzies tend to sink to the bottom of the tray. In situations where the number of moths floating on the surface is hindering the mosquito catch, cover the front of the bugeater with a 1cm mesh to keep them out. How much detergent should I put in it? 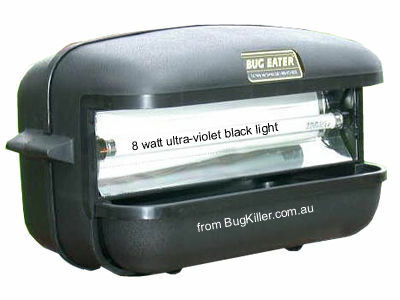 Flies are primarily attracted to smell, not light, however the Bug Eater's black light is as good as any other UV lights on the market (such as in zappers) and will catch flies in very limited applications, especially where there is non competitive light emitted. The bugeater have recorded some outstanding successes in food outlets, but have been ineffective in other applications for flies; again, there are many different breeds and activities of flies. You might want to consider using sticky fly papers as well. The bugeater has been recommended by some Council food inspectors, but sadly it will not solve your fly problem. Will it catch moths and other insects too? Yes, any insect attracted to light will be caught. Many pests go through a moth stage, for example lawn grubs. A large catch of moths may indicate the bugs are out of balance, ie in plague proportions. The moths can be recycled by putting the tray out for the birds. Once the birds discover it, you'll find it gets emptied pretty quickly. If you are really worried about the moths, then cover the front of the Bugeater with a gauze that is big enough for the mozzies to get through, but small enough to stop the moths. Too many moths can cause problems by coating the surface of the water and preventing the mozzies from being drowned. How does it compare to a bug zapper? Please read our insect zapper page to find out why bug zappers are not safe to use. We live at Tweed heads, which is currently suffering a massive mozzie invasion. I really need a good indoor solution as we are being eaten alive. Your product seems to function in the same way as the mosquitotrap but at half the price. Why is this please? Apart from the cheaper price, our bugeater does not require the ongoing expense of octenol and/or CO2 The reason is that our device targets the male mozzie, and hence the entire breeding cycle, whereas theirs targets the female (biting) insect. You might at first think that going after the the mozzie that bites you is a good idea, but in the long run, removing the males kills off the entire population and therefore the females too. Ours works best outdoors, where the mozzies breed. Kill off the breeding population outside, and you won't be bothered inside! In short our solution focuses not on the symptom, but on the cure. Can I use it indoors to protect my sleeping child? We seem overrun with mozzies, myself and young children are bitten on a daily basis - predominately inside the house! Advise exactly what I need to order for the most efficient fix to getting rid of my mozzies inside and out. Would you suggest 2 units perhaps? The inside problem will be solved by attacking the outside problem - that is where they breed! Two bugeaters will do it quicker than one, especially if they can be placed so they cover a larger area. After the initial months, you will not need the second bugeater, you could then sell it to a neighbour. Order our DEET-free roll-on repellent as a good interim measure. I've got a problem with mice, can I use the bugeater to catch them? We have a special ultrasonic mouse repeller that will help keep mice outside- where they belong. The industrial strength Rat Sonic gives off a varying electronic high frequency that mice hate. Like the bugeater, it uses no poisons, and is easy, and economical to run. Especially in the colder months, mice and other rodents, will try to move into your home or storage shed looking for shelter, warmth and food. This electronic high frequency rodent repeller will force them to seek shelter elsewhere.